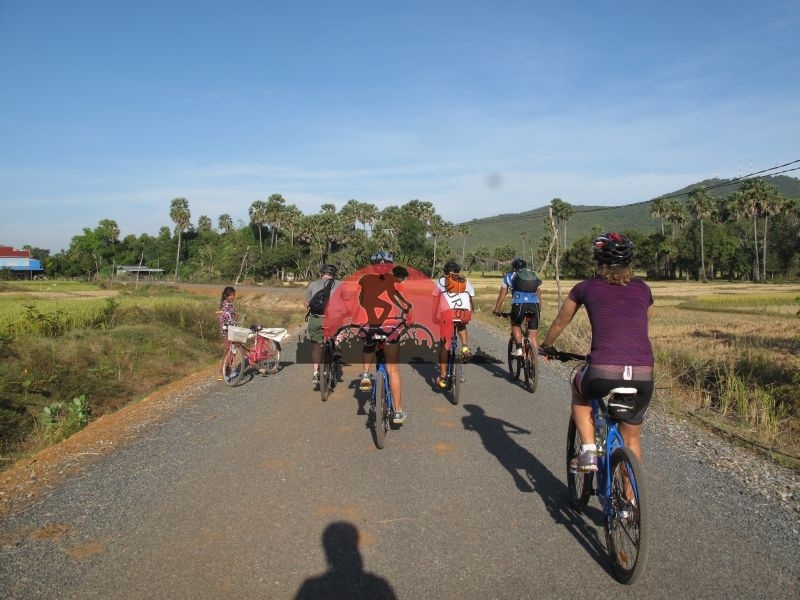 Cycle through Vietnam mountain area is the most spectacular mountain range is for cyclists seeking a biking challenge, enjoy climbing and mixing it up with some off road trails. 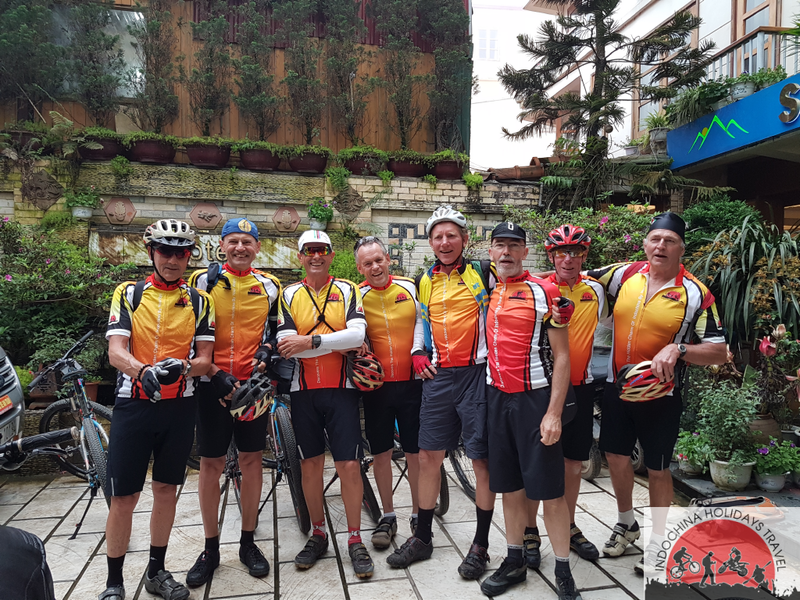 Starting in Hanoi, We cycle to the scenic hill-station of Sapa and ride the amazing mountain trails around Fansipan mountain , Indochina’s highest peak, before riding over a 2 km high mountain pass, the first of many. 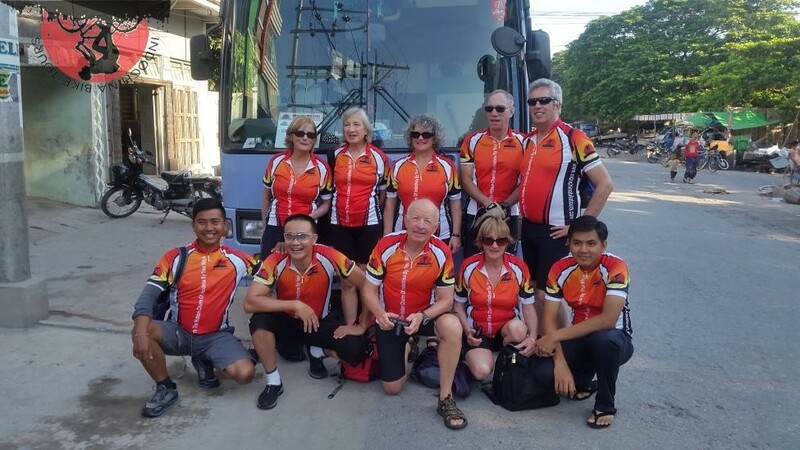 This tour goes to a part of Vietnam where few foreigners ever venture and you’ll be amazed at the colourful clothing of the many ethnic tribes as you ride through valleys and river gorges from Dien Bien Phu and to flower H’mong market in Sapa and cycle to beautiful of the bay in Halong …. 7:30 pick up at your hotel in Hanoi . Once out of the Red River Delta, which brims with traditional farming activity, we pass through limestone monoliths and into foothills populated by Muong people. We head straight at the main range before breaching a high and beautiful forested pass, which descends into the hidden valley of Mai Chau where we spend the night with friends in a traditional Thai stilt house in a Thai village. On good road looking high over distant mountains we head up into a forested region populated by H’mong people before descending into a mountainous tea-growing region. Soon after we follow a long valley floor covered in a sea of rice surrounded by Black Thai villages all the way to Son La with its bargain-filled market. Sleep in Cong Doan Hotel. Dien Bien Phu was the scene of the historic French defeat in 1954 ) . Today we will pass Pha Din passes. Very nice road and stunning landscape. 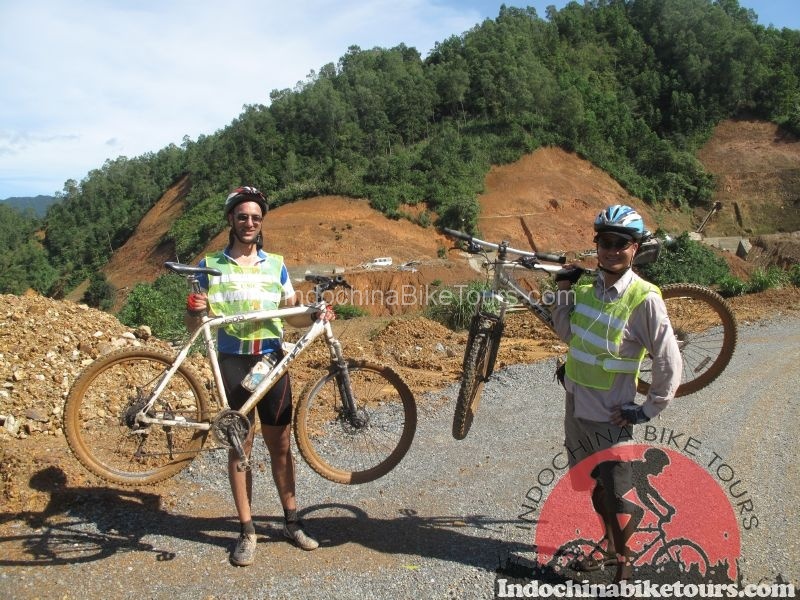 Probably the most beautiful journey of the whole trip even the road is in poor condition , Cycle along the mountain and river range culminating with the ascent of the spectacular , we will cycle up to the hill and long day for cycle Sleep in Him Lam Resort and Hotel. The most demanding and remote section of the drive takes us upstream along the left side of a Black River tributary through forest on a bumpy dirt road past isolated pockets of Tay, Thai, H’mong and Man peoples before breaching a pass to enter the Muong Lay plain, which is covered in shark’s teeth like limestone karst. The guide will buy some food to give to the head of the village and he later distributes our donations to the villagers. We stay O/N at Hoang Long Hotel. 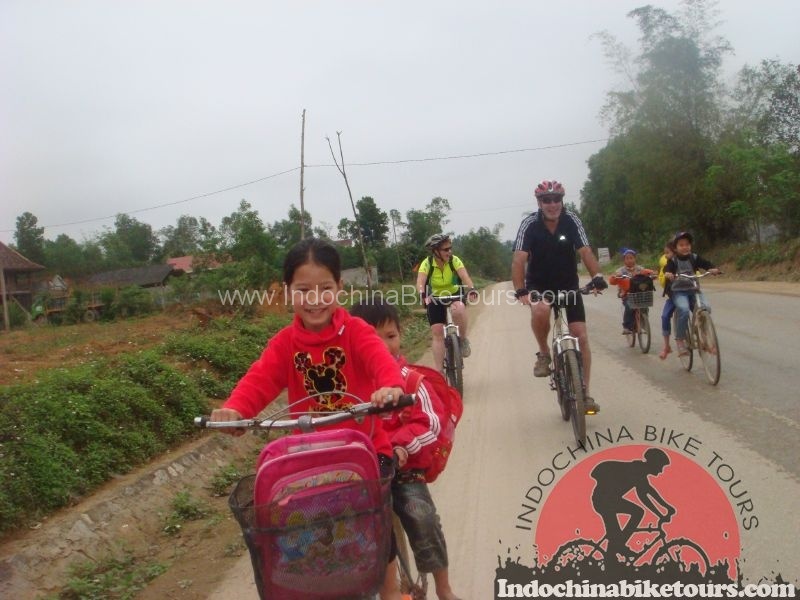 Breakfast and cycling to Lai Chau is where the Da river and Nam Na river meet. The occasion to go downstream to meet local people. We propose a picnic to have one complete day of relaxation and to discover this wild area . Tam Duong market in the morning. There are colourful Montargnard groups living in Tam Duong: Black H’mong and Dzao. 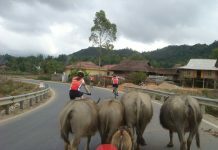 ~10 am: beautiful ride at slow pace on bumpy road to Sapa. We will have a big breakfast because there is nothing to eat on the way, just us with the wildness.Explore dinner by your own. We stay O/N in Sunny Mountain 4* Hotel. Accommodation : Sunny Mountain 4* Hotel. Day 7 : Sapa Trekking to Village ( B ) Trekking to Lao Chai villages to explore Sa Pa an old French hill-station, in a spectacular location close to the Chinese border. This morning we will trekking to Village , Lao Chai and Ta Van village ( Gxay and H’mong people ) . Pick up back to Sapa .Afternoon free to explore Sapa market and Ham Rong Mountain . 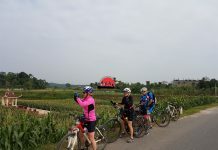 Breakfast at the hotel and start cycle down hill from Sapa to Lao Cai city and up to Bac Ha (70 km) with stunning landscape. We check in Sao Mai Hotel and have lunch. In the afternoon, we trek to Ban Pho village . Stay overnight in Bac Ha . Accommodation : Sao Mai Hotel . ( If Sunday we will visit Bac ha Market Nestled in the northern hills of Vietnam exists one of the best ethnic markets in all of Southeast Asia! On Sundays, the ethnic minorities from the surrounding villages and hills come by foot, by motorscooter, by horse, and by water buffalo for their chance to socialize, eat, drink, smoke, get a haircut, and buy produce and meat for the next week. It is a blur of colorful plaids and stripes ) . We start the day by strolling around Bac Ha market to meet with many ethnic villages in this area. We then move towards the lake Thac Ba. From Bac Ha to Luc Yen, the road is easy and sealed all the way. 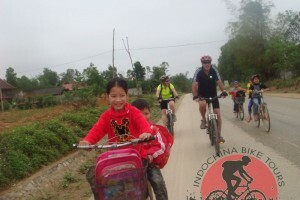 After Luc Yen, we take a small dirt track bordered by palm trees, in the middle of the karsts. A boat is waiting to take us across the lake of Thac Ba while skirting northern bank (3 hours). We arrive at Vu Linh, a traditional village of Dao where we sleep in the family of our friends. The welcome is exceptional. Quite a long drive but easy (early departure is better) from Vu Linh to Ba Be (~250 km). Ba Be is a nice stop and it is good to arrive the first day to have a full day (of the second) day there. However, if you feel like resting before, it is all the time possible to stop 50 km before Ba Be. The place before Ba Be is Na Khan, a village of Tay people lost in the forest. Breakfast and cycling through Ba Be national park to Buoc villages and Easy boating on the lake and river. Go to market (if it is the day you arrive). Stop at waterfall, beautiful swim Ong pirate, the chef of Dau Dang waterfall where we enjoy lunch. Down the waterfall, we could visit the village and a small school (only few pupils during the summer). We propose to stay in the stilt house of forest guards. 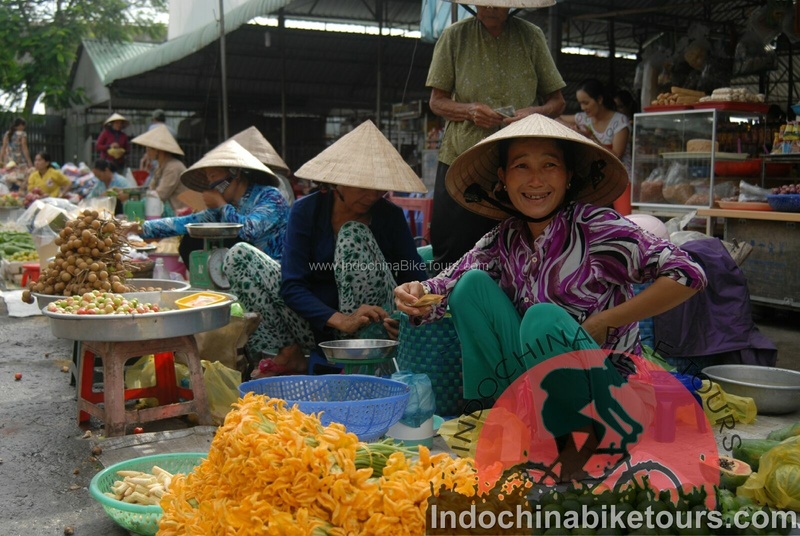 Breakfast with Nung An family and cycling to Ban Gioc waterfalls .Ban Gioc Waterfall on the Quy Xuan River is located in Cao Bang Province, nears the Sino-Vietnamese border. The waterfall falls thirty meters. It is separated into three falls by rocks and trees, and the thundering effect of the water hitting the cliffs can be heard kilometers away from Trung Khanh. Having obtained permission from the border police, we make our way through spectacular scenery to Vietnam’s most impressive waterfalls. Weather permitting we can swim right up to where the 50 m high falls hit the river. We will visit Nguom Ngao beautifull cave and then transfer back to Quang Hoa town . 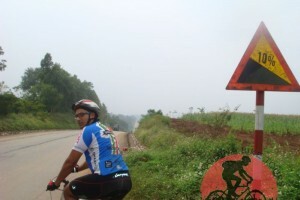 Ride from Quang Hoa to Lang Son. Continue driving toward the border from Lang Son to Mau Son. Mau Son is 30 km away from Lang Son, 1.541m above sea level. Quite cool in the evening! Night in the guesthouse of Mau Son hotel . We have a long ride mainly on secondary road, passing many coalmines along the road. We hope you are not covered in coal dust when we arrive in Halong City for dinner at the hotel , Free explore Bai Chay beach or swimming on beach . O/N in Ha Long city . Breakfast and A boat is waiting to take us to discover the Halong Bay. We first visit Then Cung cave, then a fishing village through myriads of limestone. We have seafood lunch on boat before coming back to Bai Chay and take the bus to Hanoi. We arrive in Hanoi around 4 pm. 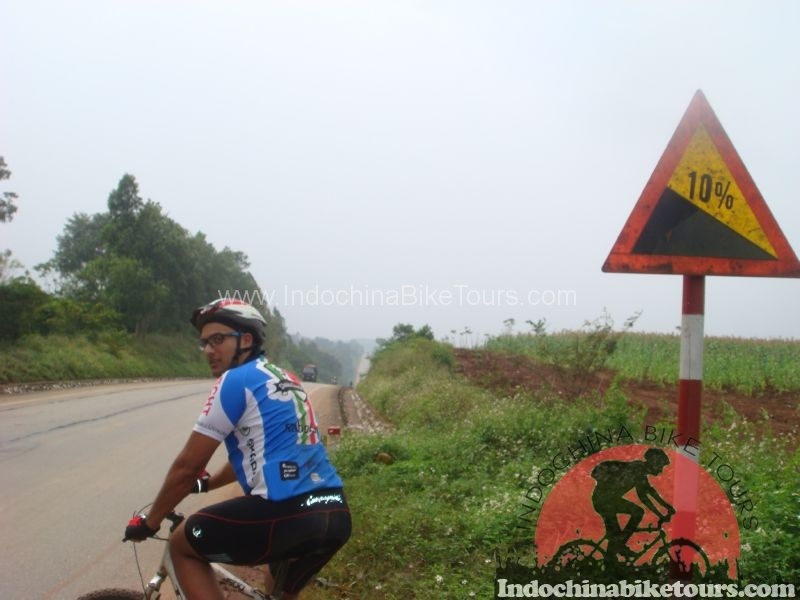 This itinerary allows for 16 days on the cycling section. You will be able to decide for yourself at any time during each of these days how far you want to cycle. Average daily cycling distances are approximately 40 -100 km. These distances may vary according to weather, road conditions and group fitness and preferences. This is a sightseeing cycle tour, not a marathon or time trial.